This blog has been written by PhD student, Alshaimaa Almehmady , who works in the Division of Molecular Therapeutics and Formulation. she would like to share her story of how her group was involved in the ‘Science in the Park’ exhibition earlier this year. With a view towards inspiring a new generation of young scientists, the School of Pharmacy organised a pharmaceutical exhibit as part of ‘Science in the Park’ day, in collaboration with The British Science Association as part of British Science Week. 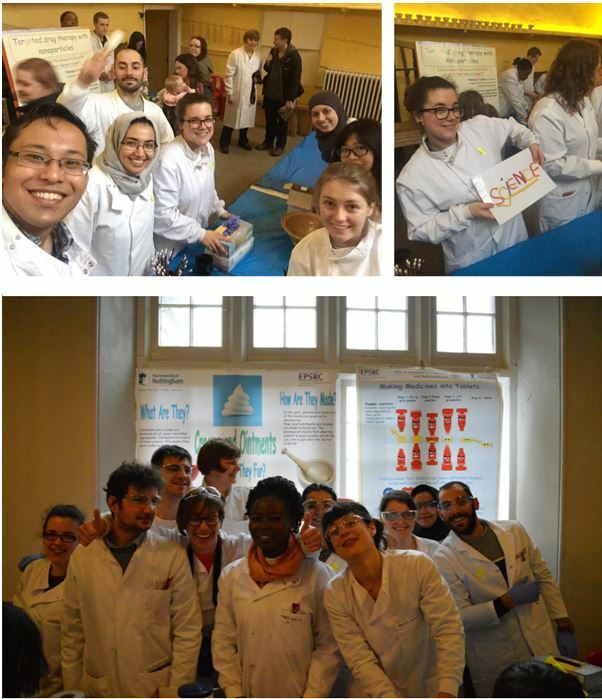 As part of a group consisting of postgraduate students and staff from the School, including those from the EPSRC sponsored Centre for Doctoral Training (CDT) in Advanced Therapeutics and Nanomedicines, we exhibited some scientific activities in order for children to learn about a range of pharmaceutical science topics. After suiting-up with tiny safety specs, lab coats and gloves, the children started the round of three different activities in high spirits. Picture 1. Pictures show the tablet press machine (on the left). 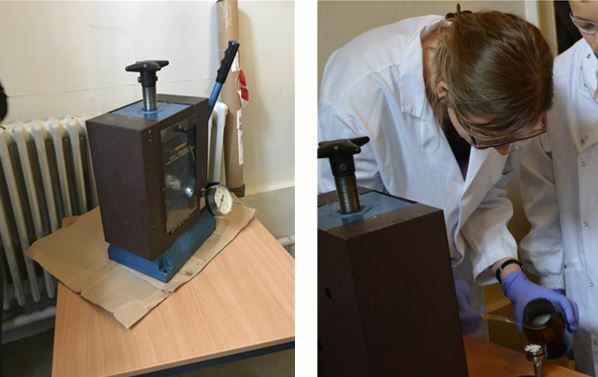 On the right Alexandra (from the CDT) is demonstrating how powder is compressed into a tablet using the punch press handles. In the first activity, we illustrated to the children how tablets were made in the old days by using a tablet press machine. We subsequently explained how in the pharmaceutical industry nowadays companies can make hundreds of tablets in no time. The children then had the opportunity to choose which type, shape and colour of tablets they wanted to make and then they tested how quickly they could break the tablets and release the active ingredient, in comparison to effervescent tablets (Pictures 1 and 2). Picture 2. Simple dissolution test of tablets was tested on the day by children to compare the rate of dissolution between normal compressed tablets and effervescent tablets. The second activity involved the preparation of a cream. We first explained how pharmacists can incorporate drugs into a cream formulation. Children then had the chance to prepare their own cream from a range of colours and smells, which they could take home as a souvenir of the day , as long as the creams had been labelled properly as a pharmacists would do (Pictures 3 and 4). Picture 3. Children suited up in a lab coat, gloves and safety specs to prepare a cream formulation. The third activity gave the children an insight into the concept of modern targeted therapeutics. Using a ping-pong ball as a drug, plasticine cut to different shapes as the drug carrier and a 3D poster showing target organs in the human body, the children could build a drug-carrier system in a shape of their choice (Pictures 5 and 6). Picture 4. To produce colourful cream, children had to choose a colouring agent to incorporate it into the cream formulation (picture on the left). After that, they had to mix components together using traditional glass mortar and pestle (picture in the middle) and pack it and label it nicely in a plastic jar. Picture 5. On the left, picture shows a model drug-carrier system where a pingpong ball is the drug and plasticine is the carrier. The plasticine was cut to shape to fit into one of the organs in the 3D poster. On the right, one of the children decided to target the brain and he is trying to fit his system into the human body poster. It was a very busy event and we were really happy to see children aged from 3 – 13 years old, plus their parents getting enthusiastic and performing the various activities. Picture 6. On the left, one of the children decided to target the heart, so she has cut some pink plasticine into a heart shape while on the right another child decided to target the lung. We showcased our first science in ‘Science in the Park’ day during March 2016 and we had around 7000 visitors. After that successful day, we participated in the science week again in March 2017. It was certainly worth all the effort put into organising the event especially when you saw the big smiles on the children’s faces. Here are a few pictures of the team (see below, picture 7) – I hope this story inspires you to start your own scientific activity for future generations! A very inspiring exhibition, offering kids a hands-on experience, capturing their imagination and making science more fun. Judging from the photo’s it looks like the project was a huge success.